Damage from the two-alarm fire in Revere. 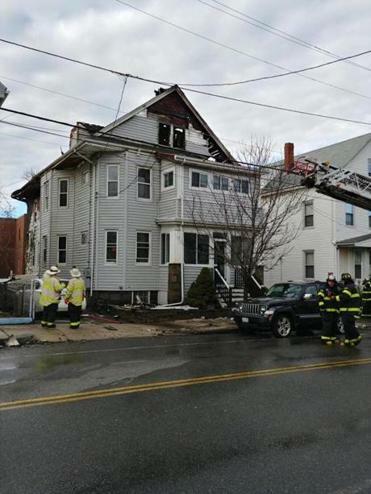 REVERE –The tenants of a two-family home at 81 Central Ave. here managed to get out of the house before the roof was consumed by a raging two-alarm fire early Monday morning. Craig Johnson and his wife realized the back of their house was on fire around 4 a.m. and immediately ran to wake up their sons, aged 14 and 11, who were asleep. There was no time to waste; they screamed in the boys’ faces. Johnson said he could see flames outside of their apartment window. Johnson’s wife Joya had been the first to notice that something was wrong. The heat coming from the rear of the house was intense. “I could feel it,” she said. They got their sons and three dogs out of the house, and Joya ran back inside to get her son’s insulin. “It was all filled with smoke,” she said. The Johnson family said the woman who lives downstairs from them also got out safely. They banged on their downstairs neighbor’s door to make sure she escaped. On Monday morning the Johnsons were standing outside of a neighbor’s house wearing pajamas with blankets wrapped around their shoulders. They were able to get their three dogs out, but besides that, all they took were the clothes on their back. They didn’t even stop to get their shoes. “We got everyone out, that’s all that matters,” said Johnson. Revere Fire Chief Christopher Bright said it’s most likely that the house is a total loss, and the cause of the fire remains under investigation. The fire also caused damage to the exterior of a house next door. Bright praised the firefighters who worked to contain the fire and prevent it from spreading and causing further damage to adjacent homes. “The guys did a tremendous job,” he said. The 2 ½ story wood-frame house is assessed at $286,100, and the total value of the property is assessed at $457,500, according to the city assessor’s records. Bill Dalton owns the property at 81 Central Ave.
Dalton lives in Winthrop and got a phone call from a neighbor alerting him about the fire around 4 a.m. Monday morning. “The worst phone call you can get,” said Dalton. Dalton said when he saw his tenants were dressed in their pajamas, he took off his jacket. “I said, ‘here, put this coat on,’” he said. He said he was relieved that everyone escaped unhurt. Dalton stood on the sidewalk, shivering and smoking a cigarette while he watched the firefighters examine his scorched two-family house. He said he wished he could help them. “These guys do a helluva job,” he said.